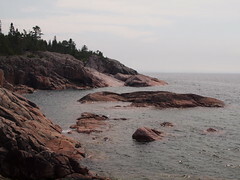 Lake Superior Provincial Park is one of my favourite places. The lake itself is brilliantly clear, the water clean enough to drink unfiltered (provided you’re drinking it well away from shore). The shoreline is dotted with uncountable warm coves to swim in (August), few bugs (again, August), and breathtaking views, but… I’m entirely biased. This landscape is home (I grew up in the area) and both Steph (the girlfriend, now wife) and I were employed by this park while going to school. Steph as a Natural Heritage Educator and myself as an Interior Ranger. Working as an Interior Ranger at Lake Superior Provincial Park came with some great experiences; one day our crew flagged down the Agawa train, rode a boxcar with the doors wide open, got dropped off at the Agawa Falls with a chainsaw and cleaned the trail as we hiked out. Then there were the multiday treks where we’d travel (portage, by canoe) through the interior of the park, self sustained as we assessed trail conditions, and explored old decomposing fly-in / hunting camps, and houses from decades gone by. I hiked all but one trail my first summer there. Man, I wish I had a camera back then. Anyhow, back to the topic of this post. 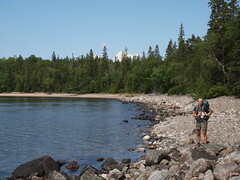 This past summer we retraced our footsteps as we hiked Lake Superior’s Coastal Trail. The Coastal Trail is about 65km, but we chose our favourite stretch – the 25km stretch between Gargantua Harbour and Orphan Lake. This portion of the trail is affectionately referred to as the “rugged” part, but “rugged” is an understatement. 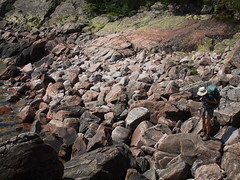 Most of this stretch of trail is off camber as you follow the exposed Canadian Shield along the shoreline and when the trail’s not threatening to toss you in the lake, then it’s ankle wrenching boulder beaches with rocks ranging from fist size rocks to the size of a cube van. There are no man made structures to assist in the undulating climbs, and the blue trail markers are few and far between (cairns mark most of the trail). Many times our route (well… usually MY route) would lead to a dead end, I’d scratch my head, Steph would roll her eyes, and then we’d spot a trail marker up on a distant bluff. If a storm unexpectedly kicked up you’d basically be stranded. Walking on wet lichen covered rock or bushwhacking your own route through the dense trees in search of higher ground with a backpack for 25km is sure to get you hurt. Good news though; it’s really difficult getting lost with the world’s largest freshwater lake on your side. The going may be slow, but the views, geology, and orienteering keep things interesting. This is my favourite hike, I highly recommend it. 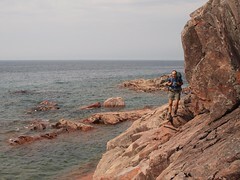 I have hiked many portions of the trails in Lake Superior Provincial Park since the mid-90′s. I still have yet to explore much of the trail south of Beatty Cove. Noisy Bay was the easiest hike, at only 2 km. 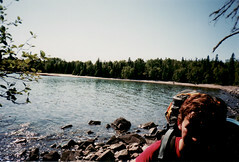 As you probably know, the section north of Orphan Lake (minus the section around Gargantua Harbour, and the section south to Beatty Cove are the most challenging. There is one favourite spot of mine, that is either north of Gargantua or Orphan Lake, where the beach is attached by a thin spit of sand to a rock island. It is an excellent beach camping spot. 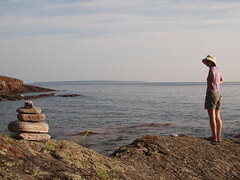 I clearly remember the cube van sized boulders that I had to squeeze my pack through on the way to Beatty Cove (I think, based on my memory of the boulder beach). Your remarks about August are spot on; it is always my favourite time to visit. For my next visit, I plan on camping along the southern section, which although close to the highway, appears to possess sand beaches where one can spend a few days and nights. Visiting Lake Superior gives me the feeling of visiting someplace “grand” and unigue. When there, I never have the feeling that I wish to be anywhere else on this planet. It sounds like your appreciation the area is similar to mine. very interesting to hear tales of other hikers that have toured that park. I worked in LSPP few years back and had to hike to noisey bay for safety once in a storm while hikinng back from wawa with supplies. it lived up to its name and the storm was wild. as beautiful as it was, I remember it being the most lonely ive ever been for some reason. one lonely night in a tent with waves and rain and wind and uncertainty lol But the things ive seen. I hiked half the trails there. hiden gem!!! !